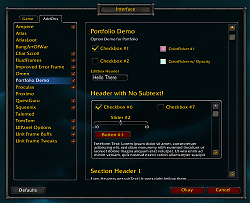 Portfolio was made to act as a bridge to accept a recognizable option table format (similar to Khaos and Ace) and convert it into a fully functional Blizzard Options Panel. Any Ace or Khaos registration should be fairly painless for an author to convert to use Portfolio, and new option sets should be easy to understand and construct without having to make any frames or manually manage controls. PortfolioDocs are also included in the download, but is not inside the addon folder itself to save space when embedding. The best way you can help would be to try and write your own Portfolio config options and see if it behaves the way you'd expect. Report any bugs or confusing implementation using the Report Bugs button or Comments. I'm also always open to suggestions and code donations via the Feature Request link. id - Unique option id. Used to create the names of the option frames (No Spaces!). Key used to store the value in the saved variables table if cvar/uvar/tvar are nil. text - Option text. String (with optional format string like %s or %.2f to insert value), function(control, key) returning a string, or both. init - (Optional) function(control) called after the option is created, for customization. Note: isUpdate is true when control:Update() is called, when the callbacks are initialized after variables load. defaultValue - "0" or "1"
dependentControls - (Optional) Table of frames to disable when this one is set to "0"
dependentOptions - (Optional) Table of id's of other options to disable when this one is set to "0"
minWidth - (Optional) min width of the control, larger text will resize the contol. Default 100. This implementation of dropdowns is about half way between managed and unmanaged. It has some shortcuts, but is essentially blizzard's dropdown code at its core. Because of this it is very powerful and can be customized by advanced users to do almost anything. But for those of you new to dropdowns you don't have to be intimidated, because I've done all the setup for you. The minimum you have to supply is a table formatted list of buttons. Each button should have a text, and a value. The checks and callback will be managed if left empty. For advanced users the func and checked attributes can be overriden. You can also use any of the normal dropdown attributes. See FrameXML/UIDropDownMenu.lua for a full list of menu item attributes. And as will all controls you can override any of the settings or methods using the init function if you need something more customized. I've also simplified the dropdown button itself, using UIDropDownMenuTemplate as a template on top of which I've added shortcuts and modifications. Texture anchors have been modified to play nicely with control:SetWidth(x) so that you don't have to use UIDropDownMenu_SetWidth. The clickable/tooltip area has also been extended to cover the whole button. Portfolio uses LibDefaults to manage your defaults for you if you wish. The normal way to handle defaults is to put the name of your saved variable table in optionSetTable.savedVarTable, but you can also supply individual options with their own varTable. Then you can supply a tvar to be the index to that saved variable table, otherwise the id will be used as the index. Alternately you can supply an option with a cvar or uvar (global variable name) to use instead. Note that if you supply none of the above Portfolio simply won't handle your variables. You can then manually update the options using the callbacks and init functions. You can also supply optionSetTable.initCallbacks = false in order to disable callbacks being fired when after the variables load. Since Portfolio has no saved variables of its own and allows you to be flexible with your saved variable structure you can easily use the same saved variables with or without Portfolio. Your Portfolio GUI options can be truly optional. I'd suggest using LibDefaults to save live memory and avoid saving/loading in default values, but you don't have to. -- Use LibStub("Portfolio", true) to fail silently if you want Portfolio options to be optional. -- Create the option table for registration. 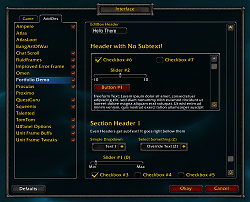 subText = "Sub header Text"
-- list of option tables goes here! -- (Optional) String or table of your addon's saved variables. Use SavedVariables in your toc! See PortfolioDocs for more information. 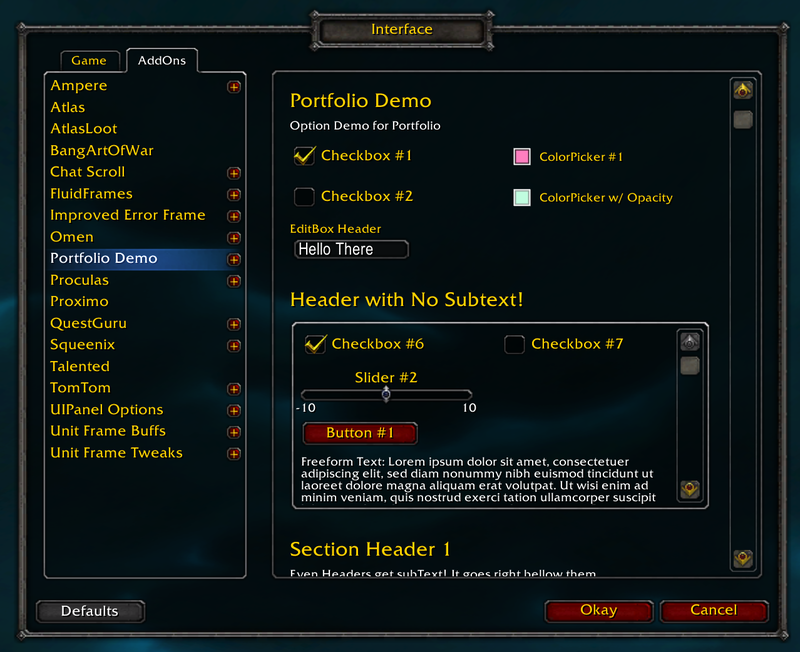 The PortfolioDemo addon is included in this package. It is disabled by default so it won't bother users, but it should be an invaluable resource to those of you who learn by example. It should have a variety of usages for each implemented option type. Window width is now modified depending on the visibility of the scrollbar. Added xOffset and yOffset fields for modifying the default offset from the anchor control. Added xOffsetRelative and yOffsetRelative fields for modifying the default offset of relatively anchored controls. xOffset and xOffsetRelative are also used in calculating the default width for windows. - Removed isTemp and replaced it with isGUI which is only a passthrough value to the callback; text and saved var are still updated. 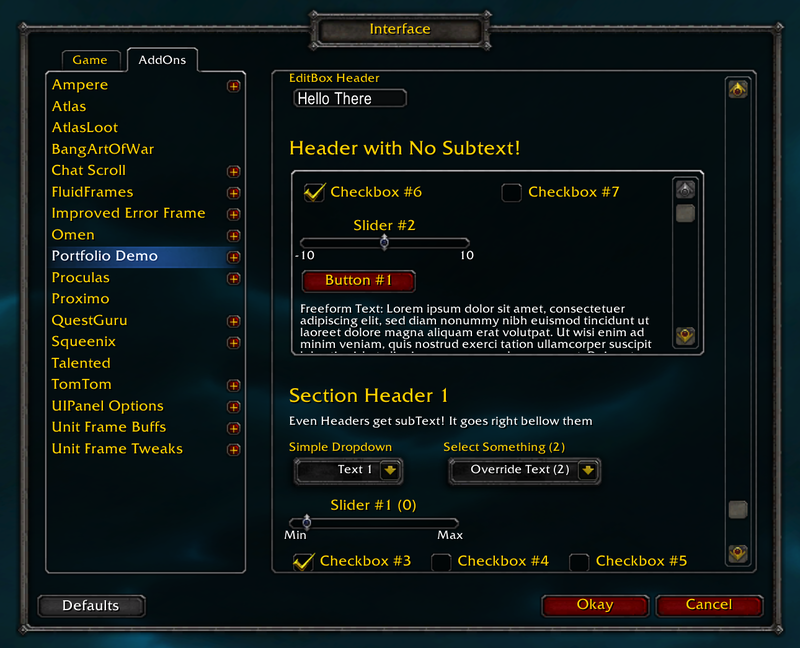 isGUI is now passed as true for all GUI control interactions (but not for the Okay, Cancel and Default blizzard option panel buttons). - Fixed Cancel to correctly revert values/controls to their previous state. Doesn't pass isGUI. - Added control:Reset() - Disable() no longer resets. - Refactored and abstracted much of the control functionality to Portfolio.Control and renamed files. - Removed noAutoDefault. Now always loads vars that have defaults set. - Added noAutoDefault param for options and option sets. If defined, option's value overrides set's values. Seems there's a bug that prevents controls in subwindows from being saved. Always register your Portfolio Options AFTER your core Lua code. Last edited by Cralor : 09-18-16 at 07:45 AM. Last edited by AnduinLothar : 02-24-10 at 02:33 PM. Hi, I am looking to convert from LibSimpleOptions to Portfolio but don't really want to rewite my whole addon to cope with all checkboxs returning 1 and 0 instead of a boolean. Is there a way to use boolean instead? [b]LibDefaults is not especially big (12KB), which includes LibStub (1.33KB), but that's a lot smaller than Portfolio (92KB). Note that these are file sizes, which only really directly effects load time with parsing and processing. As for processor and memory overhead I haven't run any extensive testing. LibDefaults is not especially big (12KB), which includes LibStub (1.33KB), but that's a lot smaller than Portfolio (92KB). Note that these are file sizes, which only really directly effects load time with parsing and processing. As for processor and memory overhead I haven't run any extensive testing. You can just embed or require LibDefaults if you want Portfolio to be optional and still want the benefits of LibDefaults. You will still have to delay callbacks until the saved variables load, but you can utilize LibDefaults' SetScript for that so you dont have to make your own frame or event handler. Note: that "evl_TestDB&amp;#91;option.id&amp;#93;" should be "evl_TestDB[option.id]" but the highlighting ate it! That would mostly emulate what Portfolio does. Except it assumes that you want all your callbacks called. If you use buttons or some other plugin control type that has a callback but not a current value then you'd need to modify your CallCallbacks function to ignore those (something Portfolio does automatically). Last edited by AnduinLothar : 02-17-09 at 05:10 PM. That works, provided you make a frame and an event driver and run it on ADDON_LOADED. Otherwise your callbacks will always be fired based on the defaults and not on any changed saved variables. Plus the way you have it written you're not passing the current values to the callbacks anyway, so that doesn't exactly mimic what Portfolio does, even if it works for your usage. Also, some control callbacks are not meant to be called on init, like callbacks for buttons, which are only called when clicked. Of course then if LibDefaults is not present you wont be able to reset to defaults and your saved variables will contain all unchanged defaults (which can increase loading time if there are a lot). But if you want to sacrifice that for the sake of addon size that's your call. My point is, idealy I'd like people to be able to run all my addons without any libraries of any sort, but if they have said library they get a nice pretty GUI to play around with. I'm not really sure how much overhead Portfolio adds other than static memory which isn't really a big deal I guess but it would be nice to know! 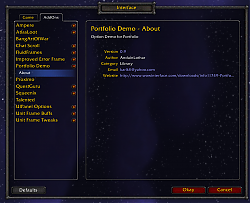 I have about 8-9 addons that are pretty small and I would hate to have to embed Portfolio in all of them. Last edited by evl : 02-17-09 at 12:13 PM. Last edited by AnduinLothar : 02-17-09 at 11:54 AM. I've gotten a bit further in my research towards a completely optional approach. My addons are known for their minimal size and I'd like to keep it that way. I modified the way the initialization of the configuration is done and so far it's working out great. Check if LibStub and Portfolio are available (note the true parameter to LibStub which suppresses any error messages if it can't be fetched). If Portfolio is present, register the options table normally. Otherwise check if the SavedVariables table exists, if it doesn't create a new table. Work through each option in the options table setting non-existing defaults (so values that were already written by Portfolio before the library was disabled/deleted are preserved) and calling each options callback. Last edited by evl : 02-17-09 at 06:37 AM. Your lib seems to be what I have been waiting for!!! I am struggeling with blizzard options for so long now. I have two addons, one is successfully writing the options to the saved variables, the other is not and I am not sure why. Therefore I have not published it yet, though it works fine for me. Both addons use the blizzard interface for customization and it is working fine so far, except making the values persistent. I wanted to write my addon without any other 3rd party lib, but for your fine collection, I'll make an exception. I've been working on incorporating Portfolio into my small addons and I've run into some design problems. Firstly I'm having problems using callbacks on other controls, an example I would like to see is a slider that when changed updates the value of a text control (I really think this should be defaut in slider as there is currently no way of knowing the sliders current value). Secondly, the handling of defaults via LibDefaults is nice and all but it creates a tight-coupling between the addon and Portfolio since disabling Portfolio will cause the addon to stop working due to the LibDefaults dependancy, currently I've implemented normal defaults handling to get around this (MyAddonDB = MyAddonDB or defaults) but it's not very pretty. Lastly, would it be possible for the about page to be optional? Currently I feel it's just bloat and adds an extra level to every panel. option:SetValue calls self:UpdateText which updates the option text to the value of Portfolio.Control.GetValueText(control, "text") which returns control.text unless the text value is a function or a format string. So by setting the text = "Name (%s)" your slider text will include the value. As for saved variables you have a number of options. 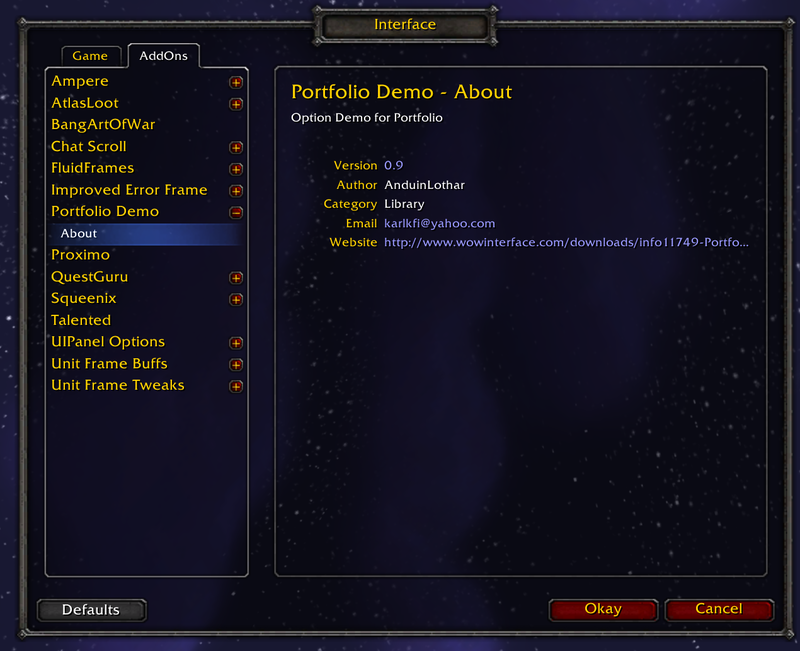 Either make your addon depend on or embed Portfolio which includes LibDefaults. Or make your addon depend on or embed LibDefaults. Or you can optionally depend on both. If LibDefaults isn't available then you are obviously going to have to handle your own variables. It was done this way for flexibility. You can decided if you want to go to the extra effort to make Portfolio and/or LibDefaults optional. Last edited by AnduinLothar : 02-15-09 at 08:04 PM. Last edited by evl : 02-15-09 at 05:07 PM.